Dunelm Group grew sales and profits and slashed debt in the six months to end December, declaring the challenges that came with its takeover of WorldStores a thing of the past. Italian sofa imports were up more than a fifth in December. Upholstery imports into Britain advanced in December as double-digit growth in the value of goods trucked in from Italy and Poland countered the impact of a fall in Chinese-made goods arriving at British ports. New facility gives Debenhams greater "liquidity headroom"
Department store retailer Debenhams has agreed access to another £40 million of revolving credit with existing lenders which it says will buy it time to organise a more permanent refinancing of its business. National furniture and homewares chain Dunelm is to sponsor ITV's This Morning, one of the flagship programmes in the portfolio of Britain's largest commercial broadcaster. The 'nominal sum' sale of upholstery maker and retailer Sofa.com might well have been for more than it first appears. Aberdare upholstery producer Ashwood Designs has more than trebled its annual revenue since 2013 with the company posting a fifth straight rise in sales, just-filed accounts show. The Swedish conglomerate behind UK kitchen retail chain Magnet says it has taken steps to insulate itself from the impact of a no-deal Brexit, but warned that political uncertainty is impacting demand. General merchandise retailer Next has added a net 147 furniture and homeware brands to its online product roster in the past two and a half years, aiding its performance and visibility in the category. IKEA Greenwich opened its doors for the first time earlier today (Feb. 7), concluding a six-year wait since local residents were first shown plans for the Millennium Way Retail Park concept. The owner of upmarket upholstery maker and retailer Wesley Barrell says he is not afraid to do "what needs to be done" in response to the economic climate and to ensure the business' survival. Designer furniture retailer Heal's says it has been left shocked by a major fire that destroyed its newly-leased warehouse and the stock stored inside, but relieved that no-one was hurt. Furniture and home accents retailer Made.com Design sustained double-digit growth at home and abroad in 2018 as it reaped the top line benefit of a £40 million influx last spring. BrightHouse, the weekly payments furniture and electricals chain, is to close 30 of its stores. That represents around a tenth of its estate and means 350 jobs are at risk. Snow prompted the second lowest weekly sales total for John Lewis & Partners in more than two years with home revenue declining for the fourth straight week. 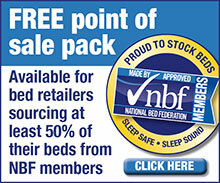 Briefly, the UK mattress industry had a new competitor. Consumers and businesses will be able to lease, as well as buy, furniture under a new plan dreamed up by IKEA, the world's biggest furniture retailer. Value furniture and homewares chain JYSK will take its UK store network to nearly 20 sites with new units primed to open in Yorkshire and Merseyside. Sofa.com owner LGT European Capital has been looking for a buyer for the upholstery vertical. Sports Direct International, parent to House of Fraser and a growing roster of retail brands, was left in prime position to acquire Sofa.com after rival bidder ScS Group exited the process. Clicks-to-bricks upholstery manufacturer and retailer Sofa.com will not become part of the ScS Group, the UK's second largest upholstery retailer said today. ScS said same-store orders at its core brand advanced in the past six months with the business primed to take advantage of opportunities as they arise. Home sales were down in eight of the past nine weeks. John Lewis & Partners approached the end of its 2018–19 financial year with a third straight weekly home sales decline, with only fashion of its main product categories lifting against year-earlier trade. ScS says it is in talks to acquire the business and assets of Sofa.com, the clicks-to-bricks upholstery vertical. It is reportedly competing with Mike Ashley's Sports Direct International.